← “The Final” question: is this really a horror movie? Danny’s Lament: Pluck your magic twanger Froggy! If you know that reference, then you are truly a Frogger junky like myself. Me and a couple of friends spent a majority of the decade from 2001 – 2009 playing the numerous modernized versions of Frogger for everything from Playstation One to the Gamecube, getting into the whole 20-year anniversary of the 80s. Yet, throughout all those releases, never once was there the inclusion of the original arcade game (while the original Pac Man landed on about a dozen Pac Man remakes). I thought that had all changed when I discovered Konami Classics Volume 1 for the Xbox 360. I FINALLY just got an Xbox 360. It took my friend long enough to cave and spring for it as a gift for me, but I guess I should forgive her since she was out of work for a year and purchased it for me like the day she found out she actually was about to be hired into a full-time position again. So, when I hooked up my Xbox 360 to my HD television with and HDMI cable and digital optical audio cable for full 5.1 surround, the first game I popped into the system to experience all the technological advances it has to offer gamers was…Frogger. That’s right. I couldn’t help myself. I wanted to at last experience the original classic arcade game on a gaming console. 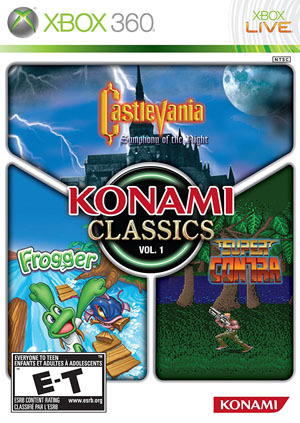 So I popped in Konami Classics Volume 1, navigated the menus past the other two pesky ‘classics’—Castlevania: Symphony of the Night and Super Contra—and prepared to leap into Frogger. This entry was posted in Living in the 80s - forever, What I'm Doing With My Joystick and tagged 1980s, 80s, Frogger, Konami Classics Volume 1, retro gaming, video games, Xbox 360. Bookmark the permalink.